Macquarie Island is the only place on Earth where the mantle is exposed above the sea level, bearing evidence of seafloor spreading. 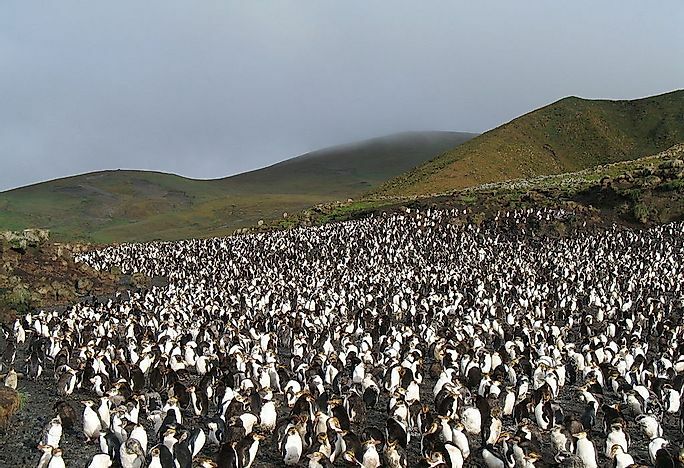 A large penguin colony at the Macquarie Island. Where Is The Macquarie Island? Macquarie Island is a World Heritage Site lying in the Southwest Pacific, halfway between New Zealand and Antarctica. The island is politically part of Tasmania, Australia, and became part of the Tasmanian State Reserve in 1978. The island was listed as among the World Heritage Sites in 1997. Royal penguins inhabit the island, especially during their annual nesting season. Macquarie Island has a population of about 20 to 40 people who live at the foot of the Wireless Hill. These people work mainly at the Macquarie Island Station which was set by the Australian Antarctic Division. Macquarie Island was discovered in 1810 by Frederick Hasselborough. Frederick claimed the island for Britain and handed it over to the management of colony of New South Wales. Macquarie Island was named after Colonel Lachlan Macquarie who was the governor of New South Wales between 1810 and 1821. The first map for the island was produced in 1820 by Fabian Bellingshausen where he also traded his rum and food for the island’s fauna. Macquarie Island became a hunting ground for the seals and penguins from 1810 to 1919. The seals and penguins were hunted to almost extinction during this period. The flora of Macquarie Island has taxonomic similarities with other sub-Antarctic islands. Most plants do not grow past 0.006 miles in height, though some species of grass like Poa foliosa may grow up to 0.12 miles in sheltered areas. Macquarie Island has over 45 species of vascular plants and almost 100 moss species. The principle vegetation formation on the island includes grassland, fen, feldmark, bog, and herbfield. Macquarie Island has over 80,000 individual seals including the sub-Antarctic, New Zealand, Antarctic fur seals, and the Southern elephant seals. Southern right whales and orcas were also common on the island. The endemic breeders on the island include the royal penguins and Macquarie Shags. Macquarie Island is an important bird area supporting over 3.5 million breeding seabird belonging to 13 species. The ecology of Macquarie Island was affected by the visit of the Europeans to the island. The seals were killed for fur and blubber.